Rainbow has been a popular recreation spot in North Tonawanda and enjoyed by western New Yorkers for over 65 years. Mr. Bale started a competitive club for figure skating and speed skating that endured through many generations and enjoyed many national and world medals. Most of these accomplished skaters started in a beginner skating class which is still part of Rainbow Rink’s schedule. The best part of this family business has been watching generations of the same family grow up and enjoy this recreational activity together. We are an entertainment center that caters to all age groups and all skating abilities. 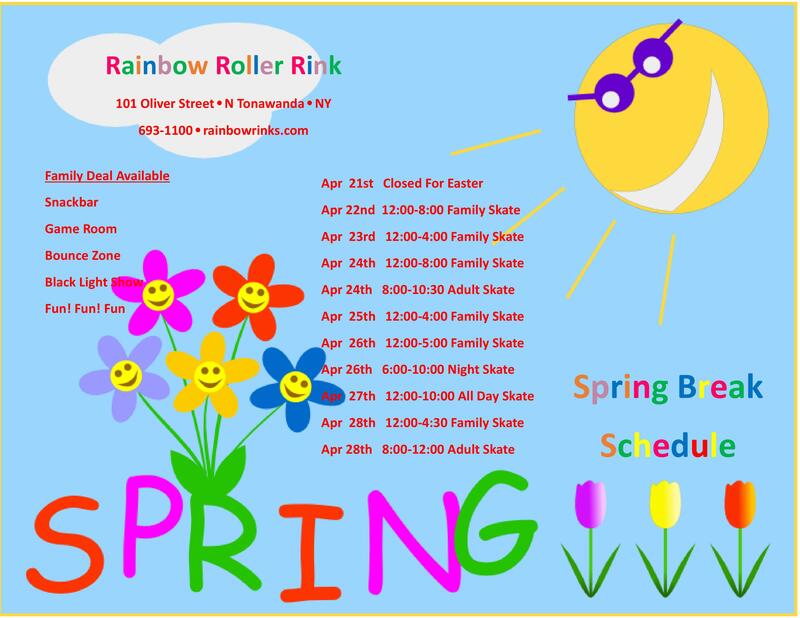 When you come to Rainbow Roller Rink be ready for a great skate time with games & races, video and redemption games, music videos and the current sports games being shown on huge screens, a bounce zone, aggressive skate park, good food and more. We specialize in birthday parties and group parties for fun or fund-raising. We have rolling fun for whole schools, classes, clubs, sports teams, PTA groups, scout groups, church groups, corporate gatherings, family reunions and more. It’s never too early to teach a child the benefits of healthy living through exercise. What better way than through roller skating? Roller skating is a way that is fun, challenging, interactive and rewarding all while providing an excellent aerobic workout.